Below is a slightly extended and revised version of the op-ed piece I had in yesterday’s Sunday Independent. Almost two years into the rescue of our financial system, and practically all the analysis of NAMA and the bank bailout so far has been about monetary, rather than real economy, aspects of the rescue of our financial system – for example, the total amount of money being given to the banks or the percentage “haircuts” on NAMA-bound loans. Just this week, there was huge focus globally on whether the amount Ireland is borrowing for the bank bailout is sustainable, given the Government is already overspending by €20bn a year in its day-to-day expenditure. This focus on money matters is understandable, not only because it’s our money as taxpayers that’s being spent but also because the original purpose of NAMA and the broader bank bailout was to save our financial system, not the wider economy. At some point, though, the focus will have to turn to the potentially huge issue of NAMA’s impact on the wider economy. Very little has been said about what economists would call the “real economy” effects of NAMA and the bank bailout. Over the past few months, however, we have begun to see the first signs, with developments at Quinn Insurance and Arnotts and, just last week, the worries expressed by Ireland’s hoteliers about the effect of NAMA on their industry. The upcoming court case between NAMA and Paddy McKillen is, at least in part, about the same thing. Essentially it comes down to what NAMA is all about. When NAMA was set up, it had just one goal – repairing Ireland’s financial system. However, it has failed dismally, as the huge amounts having to be pumped into all the Irish banks above and beyond NAMA show. With NAMA 1.0 a failure, NAMA 2.0 has its own singular goal: to not make a loss under any circumstances. On the face of it, this doesn’t sound like the worst outcome from the taxpayer’s point of view. If you told the man on the street that NAMA was going to pay €40bn plus interest, and over the next decade recoup that money, he would probably take it. However, lettting an organisation as large as NAMA loose in the Irish economy with no other aim than to break even will have huge consequences for the “real economy”, away from the balance sheets and haircuts. Over the coming decade, we will see this time and again across a range of markets. The most direct impact that NAMA will have on the real economy will be on the property market. NAMA will have what EU competition law would most likely describe as a dominant market position in the Irish property market – not quite a monopoly but still wielding huge market power. Consider commercial property. NAMA is taking on loans with underlying commercial property in Ireland worth about €8bn at the peak. Property services firm CBRE estimates that the entire value of all commercial property transactions in Ireland in the decade 2001-2010 was only about €11bn, and the bulk of that was during 2005-2007, a time of vastly inflated prices. The graph below shows the annual transactions in commercial investment properties in Ireland from 2001 to 2010, based on CBRE figures. 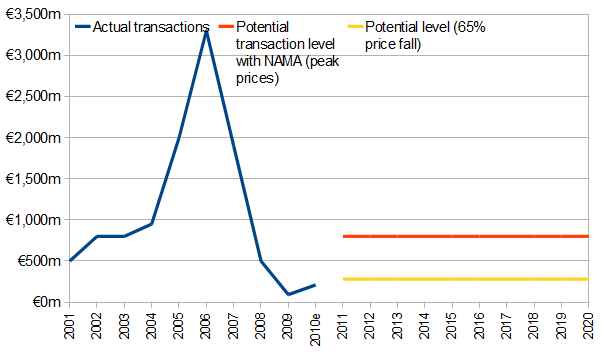 It also shows an approximate level of transactions that NAMA alone would have to bring about if it wanted to shift its loans by 2020, for two price levels the peak (approximately) and 65% below the peak. Even at 65% below, NAMA will be effectively flooding the market each and every year until 2020. Remember that it’s the aim of NAMA to wind itself down within a decade. This means that it could find itself flooding the commercial property market – and indeed the markets for development land and residential property – each and every year for the next decade. What role for the private sector, and the jobs it supports, in a country where you have a multi-billion euro property monster loose? There are wider implications than just the property market, though. How NAMA operates will have repercussions in the jobs market also. The argument made last week by hoteliers is a case in point. Their point was that zombie hotels which were completely unviable and should never have been built are currently being propped up by banks and that NAMA will sustain these businesses at the expense of more established hotels. This may be just the tip of the iceberg. The upcoming court case between NAMA and Paddy McKillen needs to be closely watched. One of McKillen’s arguments is that, in a normal financial system, he would now be extending his Wagamama and Captain America franchise further, as profitable recession-proof businesses. This could potentially create hundreds of jobs around the country. However, “NAMA 2.0” is only concerned about one thing – not making a loss. It views assets such as McKillen’s, which are mostly outside Ireland and performing, as excellent sources of revenue in its early years. NAMA is not interested in talk about new ventures and new jobs. Therefore, the banks are not interested in new business plans as this just muddies the waters with NAMA. It is telling that the recently opened McKillen franchises in the Blanchardstown Centre were done without the support of Ireland’s financial system. As the decade unwinds, this type of story will happen again and again, unless we change what NAMA is set up to achieve. In its current guise, its only goal is to not make a loss and we are therefore effectively pretending that NAMA will not have any impact on the real economy. Such a pretence may be politically expedient now, as the Government prepares for an election within the next 18 months or so and would love to show NAMA bringing in cash when it goes for re-election. But the new Government, whichever parties it comprises, will not have the same option. There are many beneficial wider economic effects that NAMA could have, if put to the benefit of the Irish people. For example, owning so much land that is otherwise useless, it could become a significant generator of renewable energy, through windfarms or biofuels. Alternatively, in control of so much empty commercial and residential property, NAMA could play a huge role – along with IDA Ireland and Enterprise Ireland – in using very cheap accommodation for workers and for business to attract foreign business and develop local business. These are just two examples – there are surely many more. I’d welcome your thoughts in the comments below. But we can only exploit these opportunities if we change NAMA from the break-even monster we’ve created. Thanks for raising this. Far more attention is needed on both the indirect economic effects of NAMA, the direct costs and conflicts of interest inherent in NAMA itself and its impacts on the ground, on property markets and land use. Hanging over the whole thing is that most of this mess was created by not more than 200 individuals in the property, banking and public sectors. It should be a priority for the ODCE and Fraud Squad to complete its investigation into the Anglo Irish Bank and to report on it to the public. I should hasten to point out that I’m not the first to think of Ireland after NAMA at all… Now would probably be a good time to mention the “Ireland after NAMA” blog! Hmmm. It seems to me that the main purpose of NAMA was to prevent a property crash, or what the government at the time called a “fire sale”. If NAMA bought up most property loans, and cornered the market, then a property price crash could be avoided. The banks and developers would stay solvent, and the government could wait for the so-called liquidity crisis to pass. NAMA has actually been pretty successful in preventing a property crash. Prices have fallen somewhat, but nothing like enough to make housing affordable for ordinary people, which is where we might expect prices to eventually settle. In particular, house prices have fallen least in rural areas, despite the fact that the oversupply is greatest there. Arguably, NAMA has had its greatest success in rural Ireland, by keeping housing costs high. NAMA is having a huge impact on the real economy by keeping the cost of property artificially high. This makes Ireland an extremely expensive place to live and do business, and undermines our competitiveness. This seems to be the main effect of NAMA on the real economy. Thanks for the comment and I certainly would agree with the importance of price competitiveness (I had a post on it only a couple of weeks ago). However, on NAMA’s impact, land values are down up to 98% in some cases, commercial property is down 50-60%, while residential property is down by up to 50% in urban areas, where transactions are happening, and by 35% elsewhere… with house prices still falling. So if NAMA has been successful in preventing a crash, I wonder what things would be like if it weren’t a success! excellent article, but anyone who knows anything about wind farms knows they are worse than useless. Great informative on the blog.Clear information this will be so helpful for all of us.